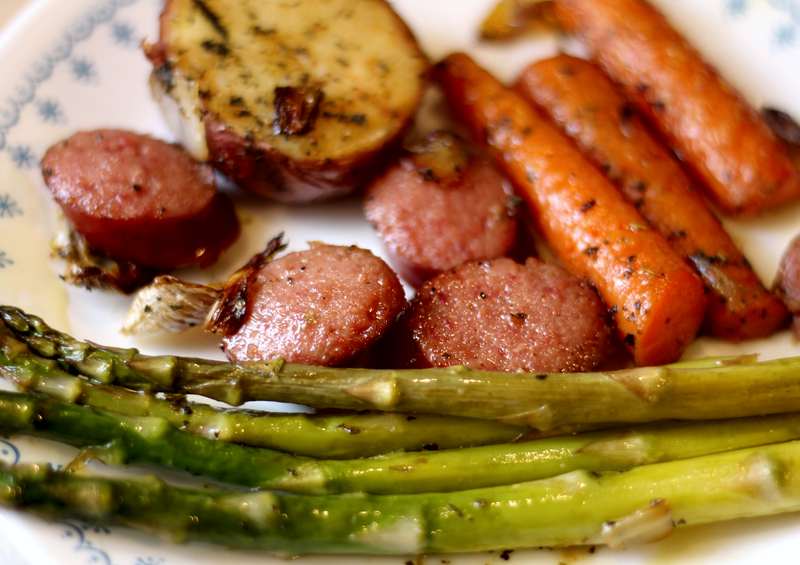 Asparagus is my favorite Spring vegetable and guilty pleasure. I love it steamed, grilled, roasted, in Pickled Asparagus, or Asparagus and Tomato Pasta Salad. However it's prepared I love it. So much so I even Freeze Asparagus for use later in the year. See, I'm addicted to it! It should come as no surprise to you then when asparagus is fresh and in season here in South Carolina, I stock up on it. I love purchasing it directly from Monetta Asparagus Farm, or at my local farmers markets. So fresh the stalks just snap! It's delicious. I also really, really love easy, one dish meals, and this one is every bit easy! One dish, a few ingredients, and you have an awesome dinner for yourself and your family. Preheat oven to 400. Spray a large casserole dish or sheet pan with cooking spray, or line with parchment for easy clean up. Cut red potatoes in half or leave whole if very small. Chop one onion into large pieces, cut carrots in half and cut thicker carrot sections in half length-wise if necessary. In a small bowl, mix 1 tsp. each oregano leaves and thyme leaves, 1/2 tsp each garlic powder, paprika and course-ground black pepper. Place potatoes, onions and carrots in prepared casserole dish. Drizzle on 1 tbls olive oil and mix to cover. Sprinkle all with about half of the spice mixture and stir well to coat. Place dish or sheet pan in oven and bake approx. 30 minutes, turning over veggies from time to time. Meanwhile, trim woody ends from asparagus, and leave whole, or cut in half. Slice smoked sausage into 1/2-inch rounds and set aside. 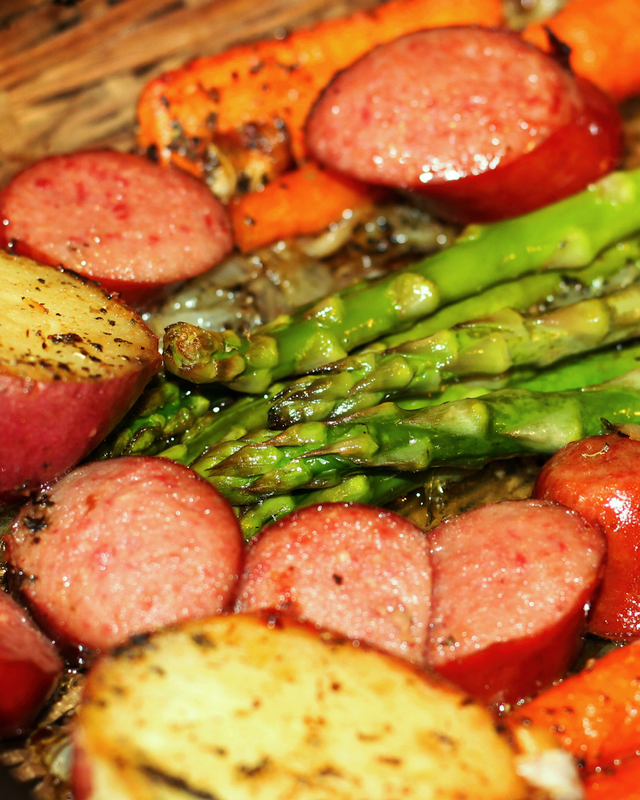 Remove casserole dish from oven and add asparagus and smoked sausage. Drizzle on remaining 1 tbls olive oil, then dust with remaining spices (you may not need all of it). 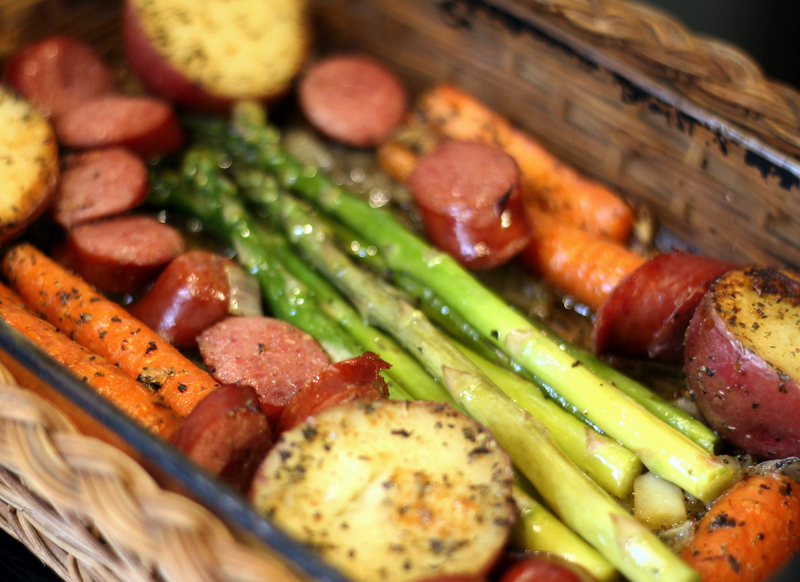 Return to oven and bake an additional 20 minutes or until asparagus is cooked and smoked sausage is lightly browned.